(1) 38 years 2 months; (2) 39 years 11 months. (1) Height 5 feet 8 inches. Weight 155 lbs. Chest measurement 36-38½ inches. Complexion dark. Eyes grey. Hair black. Sight & hearing both good. Colour vision correct. Limbs well formed. Full & perfect movement of all joints. Chest well formed. Heart & lungs normal. Teeth - false upper & part false lower. Free from hernia, varicocele, varicose veins, haemorrhoids, inveterate or contagious skin disease. Vaccinated. Good bodily & mental health. No slight defects. (2) Height 5 feet 7½ inches. Weight 147 lbs. Chest measurement 34-37 inches. Complexion dark. Eyes grey. Hair dark brown. Sight - both eyes 6/6. Hearing good. Colour vision correct. Limbs well formed. Full and perfect movement of all joints. Chest well formed. Heart and lungs normal. Free from hernia, varicocele, varicose veins, haemorrhoids, inveterate or contagious skin disease. Vaccinated. Good bodily and mental health. No slight defects. No fits. Illness - enteric fever while on active service in South africa 14 years ago. Tattoo marks - back of right forearm woman supporting N.Z. Ensign on right side and union Jack on left side. Kings South African Medal with clasps for South Africa 1901 and 1902; Samoa 1915; British War Medal; Victory Medal. Discharged on 26 October 1915, then re-enlisted in 1916 and was killed in action in 1917. Returned to NZ on 28 September 1915 'on a/c 9 months attestation'. Re-enlisted and killed in action. Timaru Memorial Wall; Washdyke War Memorial; St Andrews War Memorial; Esk Valley War Memorial. Southbridge School Roll of Honour. The eldest son of John and Elizabeth (née Hall) Campbell, Peter Campbell was born on 1 November 1876 at Southbridge, Canterbury, and named for his paternal grandfather. His father had come to New Zealand from Scotland with his family in 1865. The family settled at Southbridge. He started his education at Esk Valley School the day after his fifth birthday before moving to Southbridge School, where he met with success. In March 1885 he was presented with a prize for the Upper Division of the infants Class. The school concert and prize-giving had been delayed for more than two months because of the unfortunate death of the schoolmaster. He won further prizes – in 1888 for Standard IV, again at a delayed prize-presentation, and in 1890 for Standard VI. The Campbell family came again to the St Andrews area in 1890 – Annie, Peter, Henry and Donald; a daughter Lora May had died in 1889. On 8 April 1909 at Fanny’s family home at Otaio, he married Fanny née Brunton. At the time he was a produce merchant in Timaru. Peter left with the Seventh Contingent for the South African War on 28 February 1901 after a farewell address from the Mayor then a march to the railway station. There he served as a Corporal and was awarded the clasps for South Africa 1901 and 1902. A Certificate of Discharge was sent to his father. At that time his father had had no notification of his return, his last information being that Peter was in hospital at Natal. On return from the South African War Peter, a produce dealer, was resident variously at Fernhill, St Andrews (home), at Leeston (1903, 1905), probably with extended family, and at some time at the Police Station, Sanson (refer correspondence over carelessness in payment of his South African War Gratuity). It is possible that there was confusion over identification and the initials ‘P’ and ‘R’. Peter’s father, John Campbell, of Fernhill, St Andrews, who was known “as an uncompromising enemy of wrong, and friend of right — a man of sterling worth”, died in 1905 at the Timaru Hospital following an operation. He had been instrumental in establishing the Presbyterian Church at St Andrews, was a member of the Education Board, and just a few weeks before his death he had announced his candidature for the Waitaki seat and opened his election campaign. His mother died in 1913 at Timaru, having suffered serious injuries in a trap accident at Tycho. John and Elizabeth Campbell are buried in the Timaru Cemetery. Peter Campbell, of the firm of Campbell and Logan, was a witness in a civil case heard in the Timaru Court in early October 1911, when he provided evidence of the value of oaten chaff. By 1914 Peter and Fanny were living at Washdyke. Peter was a regular participant in the Miniature Rifles Washdyke Club, where in August 1914 he was placed third in the shoot for Mr Craigie's trophy and was the winner of Mr Harris's trophy with a score of 70. At the club’s first ball in October 1914, when the season’s trophies were presented, he was not only a prize winner, he was also one of the donors of prizes, a generosity displayed again in 1916. Initially in World War One he served in Apia, Samoa, with one of the earliest contingents. A number of gentlemen friends met Mr P. Campbell in the Washdyke Hall on a Friday night in early January 1915 to say good-bye and make a presentation to him prior to his departure for Samoa. General regret was expressed on losing Mr Campbell from the district; reference was made to his connections to the Rifle Club and the school committee. Their gift was a small sum of money, to allow him to buy something useful. Those present spoke of his good qualities and the esteem in which he was held. Mr Campbell thanked them for honouring him in such a friendly manner and for their presentation. He hoped to return and meet them all again. Peter Campbell was one of the first members of the South Canterbury Ex-Contingenters’ Association, and was elected to office in 1914. When they held their second annual meeting on 20 May 1915, Peter was named in the annual report as one of the eleven members who had already joined the Expeditionary Force. Their comrades wished them luck and looked forward to their safe return. He was mentioned again at a general meeting held at the beginning of November 1915. Peter returned to New Zealand from Samoa on 28 September 1915 on account of ‘9 months attestation’. Had he committed to a term of nine months or to service in Samoa only? He was discharged on 26 October 1915, then re-enlisted on 6 October 1916 at Timaru. He was then fit and in good condition, although he had suffered enteric fever while on active service in South Africa. He bore some interesting tattoo marks – on the back of his right forearm a woman supporting the N.Z. Ensign on the right side and the Union Jack on the left side. Corporal Peter Campbell was for a time on the permanent staff of the Timaru Defence Office. 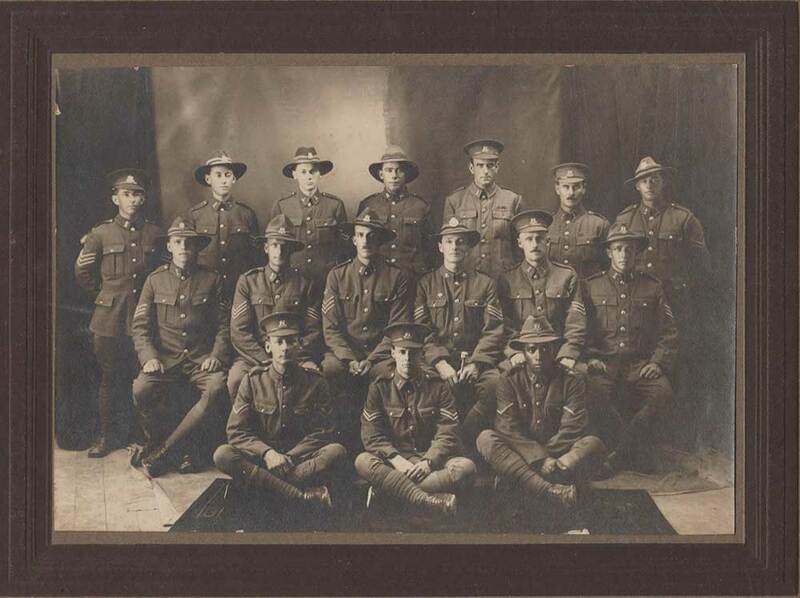 On returning from Samoa after 199 days there, he accepted a position as sergeant-major on the staff of the Timaru Defence Office, where he remained until he re-enlisted and went to the front. Major P. Campbell was a member of the management committee of the Soldiers’ Institute. There is perhaps a certain irony in that Peter was present at the meeting in December 1916, where facilities for visiting soldiers and patriotic activities were discussed. He had already given service in Samoa; not known at the time was that he would again engage in battle and lose his life. He embarked with the Canterbury Infantry Regiment by the Turakina on 26 April 1917, destined for England, where he attended group classes and gained further qualifications. He had been promoted to Sergeant on 15 May 1915 and was again on 8 February 1917. Peter first went to Rouen, France from Sling Camp on 16 September 1917, and again on 20 November. Before he left in 1917, the residents of Levels, Washdyke and Tycho gathered in the Washdyke Hall to farewell Peter and six other men. The hall was crowded, “which spoke well for the esteem in which the guests of the evening were held.” After dancing and singing, the chairman of the Levels Patriotic Committee spoke in glowing terms of the departing soldiers. Mrs Dawe, a familiar figure at all patriotic gatherings and affectionately known as the “Mother of Washdyke”, handed a gift to each soldier and, causing much merriment, “bestowed her blessing on each one”. Corporal Campbell received a handsome wristlet watch, which Mrs Campbell was asked to fasten on her husband’s wrist. The soldiers responded and three cheers were given, then dancing resumed after the singing of “For they are jolly good fellows” and the National Anthem. Just two weeks after returning to France, Corporal Peter Campbell was killed by a shell about 2pm on 5 December 1917, in the field at Polderhoek, Ypres, Belgium. Peter was one of two men from St Andrews to be killed in the same conflict on the same day, the other being William John Williams. Peter left a Will (in possession of Messrs Tripp & Rolleston, Solicitors, Timaru), which he had drawn up on 8 January 1915 just prior to leaving for the War and in which he bequeathed all his property to his wife, Fanny, who was appointed his sole executrix and had that will proved on 11 March 1918. A certificate of death was annexed to the probate. Fanny also advised that she had received a letter, dated 22 December 1917, from W. R. Davison, of the 2nd Brigade France and a friend of her late husband. In this letter he detailed the nature of death of Peter and two others with him, just 50 yards from W. R. Davidson. His medals - Samoa 1915, British War Medal and Victory Medal, issued in addition to the Clasps for South Africa 1901 and 1902, were sent to his widow in 1921, and the plaque and scroll dispatched to her also at different dates in 1921. The Ex-Contingenters’ Association requested the Timaru Borough Council to renovate the inscriptions on the Troopers’ Memorial. When this was done in 1919, additional names were added with this inscription – “This tablet bears the names of the men who served in South Africa and fell in the Great War, 1914-1918.” Ten names were added, including that of Corporal P. Campbell. The annual meeting of the Ex-Contingenters’ Association was held in October 1919, when regret was expressed that so many of their members had “gone West”. Their efforts in compiling a Roll of Honour and in getting the Council to renovate and update the Troopers’ Memorial were also noted. Thanks were extended to the Council. And the members who had made the supreme sacrifice and those who had served were honoured. On 26 August 1920 over two hundred people gathered at Esk Valley to do honour to the ex-pupils of the school who had served in the war. A monument which had been erected by the efforts of ex-pupils to the memory of their fallen schoolmates, was unveiled by Mr J. G. Gow, ex-inspector of schools for South Canterbury, who knew all the boys whose names and photographs appeared on the roll of honour - thirty-eight in total, of whom eleven had fallen - a heavy toll for that small district. Sergeant P. Campbell, France, 1917 is one of the names inscribed on the monument. The Rev. E. K. Mules said “it was fitting that a monument should be erected there in memory of the sons of old pioneers, men and women who had come there over forty years ago and made the early history of the district. They had helped on the work of the country, their sons had died for it, and it was the duty of all who were left to carry on in the same spirit of self-sacrifice.” He sympathised with those who had lost sons or other relatives; “their lives were not given in vain.” The monument and roll of honour were entrusted to the School Committee for the school. The Washdyke Memorial – a shaft of New Zealand granite with a spire 20 feet high – bears the following inscription: “In grateful memory of the Levels and Washdyke men who gave their lives in the Great War, 1914-1918” followed by the names, among them Peter Campbell. This memorial was unveiled by the Hon. James Craigie, M.L.C., on 10 June 1923. The Battalion Band was present and the hymn “O God, Our Help in Ages Past” was sung. The memorial was the local headstone to those men who had saved the country in a time of grave danger, said Archdeacon Jacob. “It spoke eloquently of sacrifice and service.” The Hon. Craigie said that “his sympathy went out to all relatives of men whose names were engraved upon the stone. We had sent over the seas 100,000 men, and had lost some 17,000.” Twenty-seven men had left the Washdyke and Levels district, and seven had made the supreme sacrifice. The ceremony concluded with the singing of the hymn “Nearer, My God to Thee” and the “Last Post” played by the bugler. Peter’s brother, John Henry Hall Campbell also served in World War I, as did several cousins, some of them losing their lives - Donald Campbell (4/697) of Temuka, who died of wounds in 1916, and his brother Peter Duncan Campbell; George Duncan Abbott who was killed in action in 1915, Ameral Christopher Abbott, who died of wounds in 1915, and their brother and sister, Charles Gordon Abbott and Fanny Abbott, who both served. Possibly 19 year old Peter Duncan Campbell who died of wounds in 1917, was a relative. In May 1928, the Old Pupils’ committee of Southbridge School agreed to a design for a memorial to all those who had served. The name of Peter Campbell was one to be marked with a cross to signify that they had made the supreme Sacrifice. As early as August 1919 his name had been submitted for the Honours Board at the Southbridge District High School, and the Roll of Honour was to be erected by the end of March 1920. Fanny remembered her husband in an In Memoriam notice in the Timaru Herald of 5 December 1918 - “So dearly loved, so sadly missed.” Another from Fanny’s parents read “He freely gave his life, his best, his all.” Alongside these is the message for Peter’s companion William John Williams. Fanny remembered again in 1919 and 1920. In December 1919 she was one who contributed to the Timaru War Memorial fund. She herself died in 1924 and is buried at Waimate with her parents. The headstone inscription remembers her husband Sergeant Peter Campbell killed at Passchendaele in 1917. Corporal Peter Campbell is commemorated on the Buttes New British Cemetery (N.Z.) Memorial, at Polygon Wood, Belgium, and on local memorials at Timaru, Washdyke, St Andrews and Esk Valley, and on the Southbridge School Roll of Honour.